Attendees at the Newberry CSD's General Meeting in January inspect the fire department's recently acquired used brush patrol vehicle. 1,200-acre Minneola solar project cancelled. The Minneola Solar Project has been removed from the San Bernardino county's solar project list. The surprise removal was first noted on a January 17, 2019, list of active solar projects. The dropping of the project has been confirmed by county planner Tom Nievez. The project is the smaller of the two major projects that were being planned for the Silver Valley. The much larger 3,500-acre Daggett Solar Power 1 is still progressing and threatening Newberry Springs. The Newberry Springs Community Action Guide developed by the county recognizes on page 19 under Public Health Indicators subheading Chronic Disease that, "Generally, Newberry Springs experiences higher rates than San Bernardino County for hospitalization and emergency room visits for chronic diseases, including chronic obstructive pulmonary disease" (COPD). This fact could be attributed to Newberrians living in a Sand Transport Path (STP) of blowing PM 10 invisible sized silica dust. 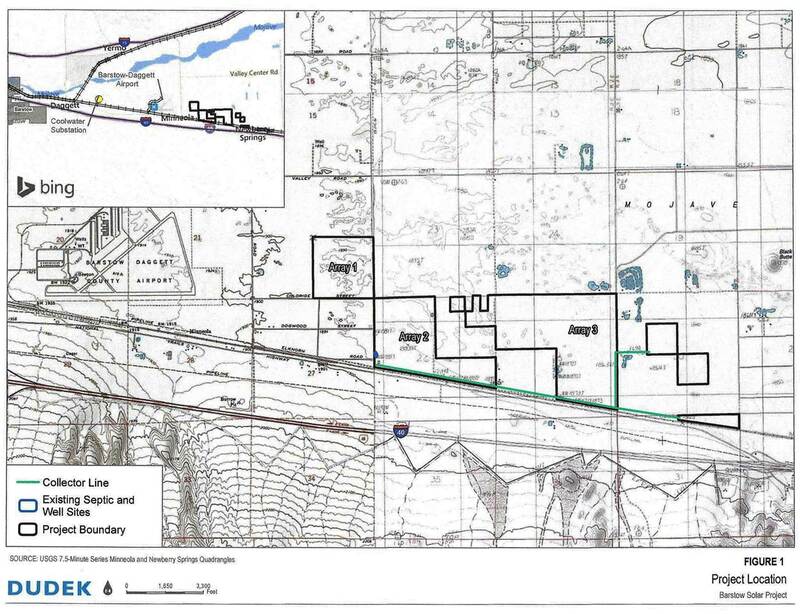 The proposed Daggett Solar Power 1 project is expected to greatly increase chronic lung disease in Newberry Springs. The January 2018, Newberry CSD monthly board meeting was largely boring as the board members spent far to much time deliberating some procedural changes for future CSD agendas. Of interest, after a year of inaction, the CSD finally placed itself publicly in favor of the county's Renewable Energy & Conservation Element's proposed Section 4.10. The CSD board will be submitting a letter to the county Board of Supervisors in support of Section 4.10's adoption which is aimed to help protect some Rural Living zoned communities from utility-scale solar development. The CSD board's action seems to be evolving to shake-off the continued reporting of its negligence to represent the community on matters where it can be a community voice. Director Larry Clark's pay increase fails. The board's most interesting January agenda item was Director Larry Clark's attempt to have the director's $50 per general meeting stipend raised to $80. Director Jack Unger, apparently feeling an impact by this news blog's previous write-up on him, did a flip-flop from this blog's previous report on his belief that the community wants to "generously reward" the CSD's directors for their leadership. During the discussion of Clark's motion, Unger queried Clark over the need and purpose of increasing the amount of the existing stipend. Larry Clark's justification for a stipend increase sounded like excuses based upon entitlement. Entitlement because the current stipend hadn't been increased in years. Entitlement because other CSDs have directors believed to be paid more. Entitlement because the directors are important people and they simply deserve more. One director commented that he figures that sometimes he is reimbursed at less than $5 per hour. For him, his statement is undoubtedly correct. This blog's position, however, is that the elected directors run for their elected positions voluntarily and that the positions should not be tainted with compensation. Many people in Newberry Springs serve the community on school, church, senior, youth, and other organizational committees voluntarily without compensation. Just because the CSD directors have access to taxpayers' public funds shouldn't justify them grabbing themselves a portion of it. The directors should cease accepting their current stipends or get off of the CSD board. The directors' heat of biting into Larry Clark's proposal for a pay raise was politically too hot of a chili pepper for the directors to digest and the motion failed with only Larry Clark supporting it. Once a month representatives from Barstow Heights, Daggett, Helendale, Newberry, and the Yermo CSDs gather for lunch in Barstow, often with county representatives, to share information. Director Deel attended the last luncheon and submitted a short written report at the January Newberry CSD board meeting capsulizing the Multi-CSD meeting three weeks earlier. Under the heading of Yermo CSD, Deel mentions, "Fire Department received $99,000 from Cal Fire for services donated during the many fires last year. Yermo Fire volunteers filled in for Cal Fire Fighters at stations so the Cal Fire Fighters could fight forest fires." This information was also stated months ago at a Multi-CSD meeting in which Deel attended. Why the Newberry CSD hasn't been openly discussing it is questionable. Yermo appears to be tapping into a great revenue source. Cal Fire has a problem. In times of massive forest fires in California, Cal Fire wants to deploy its resources from its network of outlying stations. Unfortunately, it also needs to keep those stations manned for possible local fires. Yermo Fire is contracting itself out to handle a Cal Fire station which allows Cal Fire to deploy that station's equipment and personnel elsewhere in the state. This is a great win-win for everyone as Yermo's Fire personnel can volunteer and earn good extra income. Yermo CSD makes money by participating and making available its personnel and a truck. Cal Fire benefits with the extra resources that it is happy to pay for. As stated above, last year the Yermo CSD earned nearly $100-thousand in which it can build its fire department and community services. The only drawback is that the Yermo Fire volunteers can be away from their homes for sometimes a week which is hard on their families but their pay compensation is rewarding. Director Deel's "CSD Luncheon Notes" also state for "Helendale CSD" that the Helendale CSD, "Received a $100,000 grant for their park; have 2 buildings going up; 2 volleyball courts; outdoor exercise equipment. Basketball starting; New baseball field ready. They are now applying for an eight million dollar grant." This also isn't new information for Director Deel (and Director Paulsen who frequents the meetings). The Helendale CSD progressive directors have been reporting on their park development advances at the Multi-CSD meetings for two years. What they are accomplishing is amazing for Helendale's citizens. What Deel omits is new field lighting, irrigation, new public restrooms, pavement, and more for Helendale. Meanwhile, the Newberry CSD directors haven't done much for their community. Perhaps, if the Newberry citizens enjoyed the benefits of a growing community, they would support a stipend increase. Meanwhile, the 60-year old Newberry CSD can continue to hang its head in shame for what little it has accomplished.